Trimming your dog’s nails is part of good grooming. Untrimmed nails leave dogs vulnerable topainful broken nails. Ingrown nails arealso a danger when a dog’s nails are not properly maintained. If your dog’s nails click against hardfloors then they are too long. Make sure you only trim the excess length and always avoidnerves and blood vessels. This willensure a painless trim process. The'quick' is a blood vessel that runs through the middle of the nail. It grows as the nail grows so if you wait along time between cuttings the quick will grow closer to the end of the nail. This means a greater chance of bleeding duringtrimming. 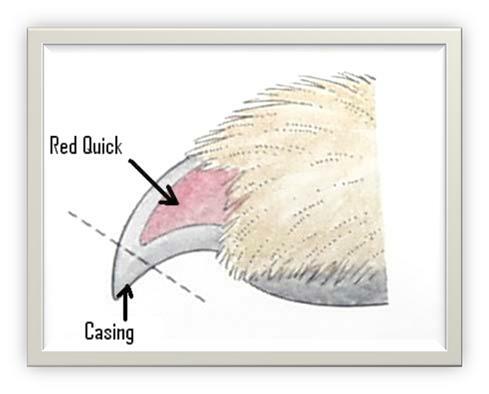 You will need quality dog nail trimmers and some stypticpowder such as Kwik-Stop or CutStop Styptic Pads to stop bleeding just in caseyou nick the quick. Invest in a qualitypair of dog nail trimmers in an appropriate size for your dog since they canlast a lifetime. You can find manychoices ranging from a simple design to some really uber cute designs anywheredog supplies are sold. So how do you trim the nails? There are three ways to get the job done. The standard way is using a dog nail trimmer. First, let your dog settle into a comfortable position, eithersitting or lying down. Hold his pawfirmly and push on his pads to extend the nail. If possible locate and avoid the quick. Clear nails will reveal a pink color indicatingwhere the quick ends. Dark nails tend torequire guessing the location. 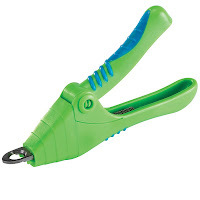 Cut the nail below the quick on a 45-degree angle with thecutting end of the nail clipper toward the end of the nail. If your dog has dark nails you may want tostart at the end of the nail and make a series of small clips. I have been told to look for a black dot in the center ofthe nail which is the start of the quick. I can’t find it on Kirby’s nails but you mayhave more success with your dog. Withdiligent trimming the quick will retreat into the nail allowing you to cutshorter amounts each time. If your dog has brittle nails, the cut may splinter. To smooth the nail use a nail file in asweeping motion from the back through the curve and to the tip. Don’t forget the dewclaws which left unattended can causeespecially painful ingrown problems. They are 1” - 4" above the feet on theinner side of the legs. Many owners andbreeders have these removed when they are puppies. Kirby’s were removed when he was less than twoweeks old. If you accidentally cut the quick, wipe off the blood andapply Kwik-Stop or styptic powder to stop the bleeding. This type of accidental injury is not seriousand will heal in a very short time. However, it is painful and can make futureclippings difficult so be careful. Take frequent breaks if necessary. If your dog is not used to having his nailstrimmed then start slowly and gradually work up to simply holding his toesfirmly for 15 - 30 seconds. Do not lethim mouth or bite at you. It can take daily handling for a week or more to get somedogs used to this. When your dogtolerates having his feet held, clip just one nail, and if he is good, praisehim and give him a treat. Sometimes iteasier if one person does the nail trimming while another person keeps the dog’sattention occupied with treats. Waituntil another time to do another nail. Continueuntil all nails have been trimmed. Slowlyyou will be able to cut several nails in one sitting until finally all thenails can be trimmed in one session. Youshould trim the nails a small amount each week to help your dog get used to regulartrimming sessions. Kirby has black nails so I get extremely tensewhen trying to cut them. He picks up onthis and fights every step of the way. Iconcluded I just couldn’t cut them myself. 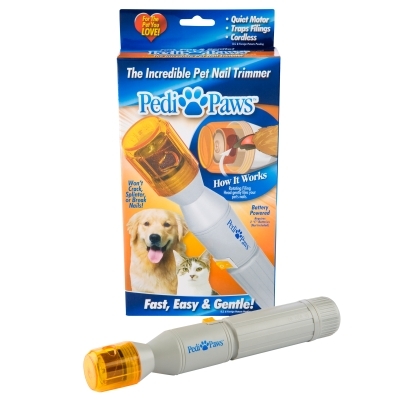 Another way to trim those nails is using Pedipaws™. This revolutionary nail trimmer for your dog (orcat) is the newest and fastest way to keep your pet´s nails trim rounded andsmooth with no mess. It has a precision emery filing wheel thatgently removes thin layers of the nail. It has a unique protective cap which allows only the perfect amount ofnail to be removed and contains all the filings so there´s no mess to clean up. Many people have had success with thisproduct so I purchased one. I started out getting him used to the sound it made. Then I started touching his foot with it. I don’t know if his nails are supersensitive but he couldn’t seem to tolerate the tingling feeling it gives him. I ended up giving it to a friend who uses it on her little shih-tzu with no problem at all. 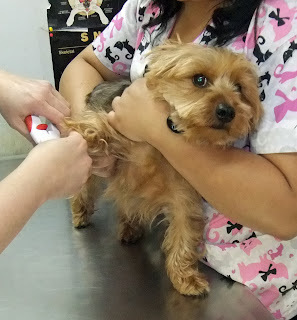 Finally, there is the visit to your veterinarian or dog groomer. This is our method of choice! So for $7.00 every two months Kirby visits Dr. Rita for a painless trimming that only takes a few minutes. He loves to visit so it's a win-win situation. Kirby is happy so I'm happy too! 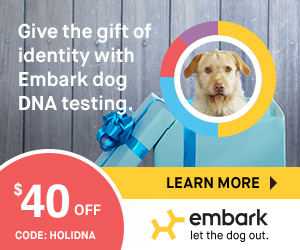 Whichever method you choose, your dog will appreciate theend result.